This year, I have taken a different approach to teaching French that maximizes the amount of time students are speaking in the target language. It has been great so far but it has taken some time to get used to how loud it can get in the classroom. This means that I cherish those rare moments when the noise level comes down a notch or three, such as when we sit down to practice mindfulness during Health class, a time when a quiet environment is absolutely essential. I am also constantly aware that the noise level in my classroom can have an impact on the classes nearby, or below whenever I am teaching on the upper level of our school building. This is especially true whenever I ask students to get up and dance during our body breaks. To me, the unpleasant sound of chairs scraping against the floor as they get up from their seats is the equivalent of the sound of nails on a chalkboard. Eek! Fortunately, our school uses tennis balls on the bottom of chair legs to help reduce classroom noise. We have been using them for several years. However, they sometimes become loose or go missing and need to be replaced. For this reason, I am grateful for National Bank’s On The Ball Program. 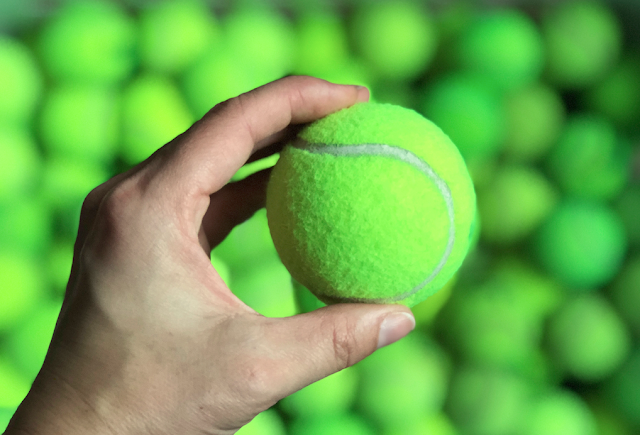 Currently in its 11th year, the program is an effort to collect used tennis balls from tennis clubs and tournaments, and then donating them to schools to place on the bottom of chair legs to help reduce classroom noise. And yes, something this simple really can provide students with a quieter and more learning-friendly environment. 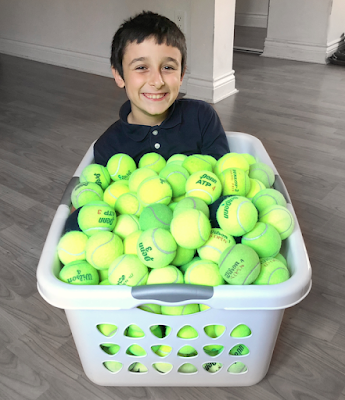 National Bank has collected more than 1,600,000 tennis balls to date, helping to change the day to day learning experience of over 375,000 students in Ontario and Quebec! To add some perspective, I received a box filled with 150 tennis balls and it was just enough to fill our large laundry basket. The approximate equivalent then would be 10,000 laundry baskets full, each one providing quiet feet for 35 student chairs! I was surprised to learn that a tennis ball can last as little as three rallies for professional and semi-professional players. Amateurs may be able to use the same ball for longer but after about ten games, the ball’s pressure decreases and is noticeable to the touch. By using these balls as chair slippers in schools, their lifespan is extended by three years. These balls would otherwise take 2,500 years to biodegrade in a landfill. Who knew? Good news is On the Ball recycles further by creating tires and outdoor playgrounds. And that's music to my ears! If your school would like to receive tennis balls, you can sign up for On the Ball support at nbc.ca/ontheball. Tennis clubs can also sign up and receive an On the Ball kit. Disclosure: This post has been sponsored by National Bank. Any opinions expressed in this post are my own. Some of the chairs in my room have tennis balls, some do not. I'm going to go sign up! Thanks Diana! I have heard about this a few weeks ago and think it is a great idea. It would help those who need to concentrate. This is a great idea and the tennis balls on the chairs sure help a lot!! lik the tennis balls on the chairs and they would help a lot! This sounds like a great idea -- thanks for sharing! Such a useful idea! wow.... Thanks for this share. I love this idea! I can still hear the sound of the chairs scraping the floor in school and it can be distracting.